Campaign workers were arrested while putting up banners. 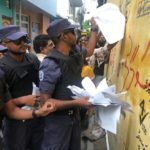 The Maldives Police Service has denied obstructing the opposition campaign after complaints about the arrest of activists and forced removal of banners and posters. 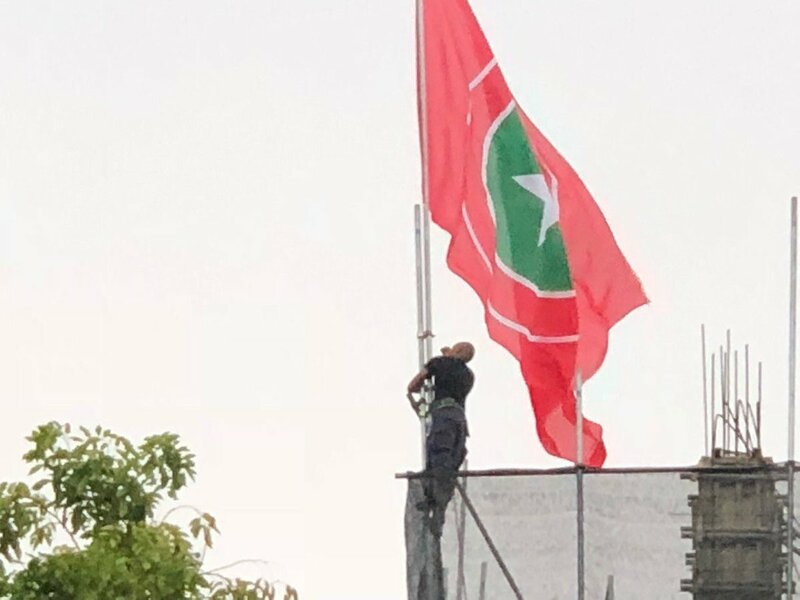 Three campaign workers were arrested Tuesday while putting up banners of opposition candidate Ibrahim Mohamed Solih ‘Ibu,’ and police officers removed a Jumhooree Party flag hoisted on the 12th floor of the Galolhu Asdhoo house in Malé. Raajje TV cameraman Hussain Fazeen was arrested while trying to film the removal. He was released shortly afterwards, as were the campaign workers. 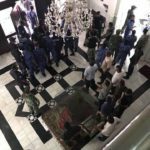 But police claimed in a statement Wednesday night that it has been “fully providing all required security and cooperation without prejudice to all political parties” ahead of the September 23 election. Parties were urged to “adhere to the general principles and code of ethics stipulated in the Elections (General) Act and the regulation on the use of the national flag” when putting up banners, flags and campaign posters. Police did not explain how putting up posters or banners contravenes electoral laws. Regulations enacted last year prohibit flying another flag higher than the national flag. Sameer questioned why the police did not instruct the house owner to lower the flag. He noted that the ruling Progressive Party of Maldives is allowed to put up flags and banners without any obstruction. 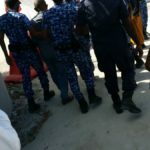 Raajje TV reported Wednesday that police CCTV cameras in Malé were re-positioned because PPM flags were blocking their view. “We are campaigning against all odds. 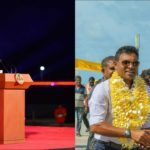 The whole state, including the police and independent institutions, are on one side,” Imthiyaz Fahmy, spokesman of the main opposition Maldivian Democratic Party, told the Maldives Independent. Aside from “unreasonable rules and decisions” that block campaigning, the lawmaker highlighted negative campaigning by state-funded media and the refusal to allow the opposition to hold rallies in Malé. “We do not have a free environment to campaign. Our office windows have been shattered so many times. Our campaign halls have been vandalised. All of this has been lodged with the police but not a single culprit has been found,” he said. 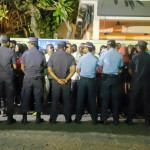 On Monday night, opposition supporters who were putting up banners in the capital’s suburb Hulhumalé were stopped by police and staff from the Housing Development Corporation. The state-owned company says permits are required. 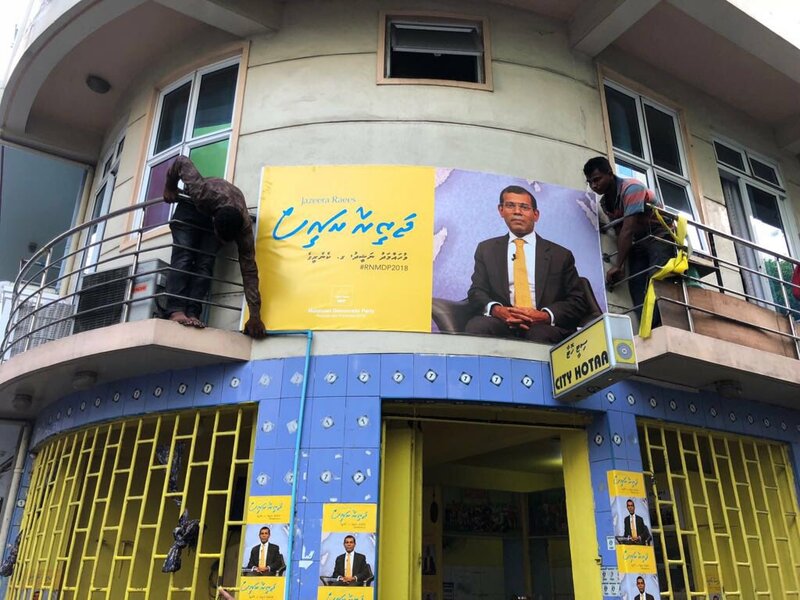 On Tuesday, migrant workers acting on the orders of policemen were seen taking down banners from the Maafanu stadium and a large poster of former president Mohamed Nasheed atop a café. 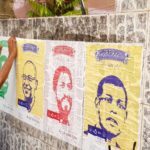 Earlier this month, police threatened “legal action” against the use of campaign posters of convicted opposition leaders. The EC doubled down on the threats and warned parties not to involve convicted leaders in their campaign. Opposition campaign material is also removed on islands before the president’s visits. Earlier this week, the Shaviyani Feydhoo MDP meeting hall was vandalised with used oil while a similar attack was reported at the campaign hall in Thaa Thimarafushi. The MDP meeting hall in Hulhumalé was also vandalised recently and a group attacked people inside the party’s office in Addu City Maradhoo. It is unclear if any arrests have been made. A police spokesman was not responding to calls. A hut built on Gadhdhoo island in Gaaf Dhaal atoll to welcome the president earlier this month was meanwhile burned down this week. A 41-year-old man was promptly arrested in connection with the suspected arson. In Hulhumale for Eid celebration with extended family when a staff from Housing Development Corporation @hdcmaldives knocks on the door with mutton in Yaameen’s campaign packaging. Ruling party activists have removed opposition campaign banners hung on trees on Sosun Magu and replaced them with their banners. Government’s campaign openly inciting to hatred & violence. @ElectionsMv & @PoliceMv miss this too?